FinePrint gives you almost complete control over anything you print. The program can print up to eight pages on a single sheet of paper, print double-sided pages, create booklets, add watermarks, create stationary, and more. 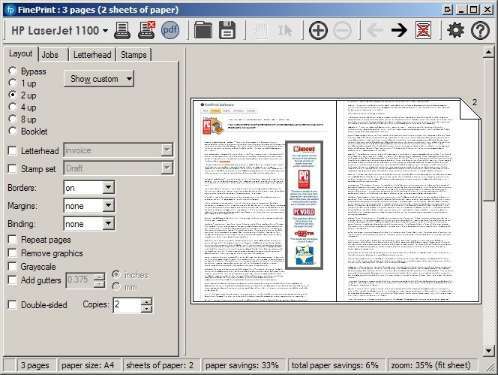 It also lets you combine multiple documents into single print jobs. It can strip out images from documents or Web pages. FinePrint lets you see what you're getting before you print, and to delete individual pages if need be. Print large, unwieldy documents in convenient booklets, or at 2, 4 or 8 up thumbnail size. Great for manuals, legal briefs, transcripts, presentations, Acrobat (PDF) files, manuals, source code, web pages and email. Because FinePrint is a print driver, you can access the program only by printing from within an application; and to print only one page of a multipage doc you need to remember to select the page in your Printer dialog box, then choose FinePrint as the printer and click OK.
* Mark documents with custom watermarks such as "draft" or "confidential". * Create custom electronic letterhead and forms. No more buying, storing and manually loading pre-printed letterhead. * Page numbering over multiple documents including Bates stamping. * Output pages to clipboard. * Save pages in JPEG, TIFF and text formats. * Highlight, delete and redact text. * Remove all or specific graphics. Qweas is providing links to FinePrint 7.01 as a courtesy, and makes no representations regarding FinePrint or any other applications or any information related thereto. Any questions, complaints or claims regarding this application FinePrint 7.01 must be directed to the appropriate software vendor. You may click the publisher link of FinePrint on the top of this page to get more details about the vendor.